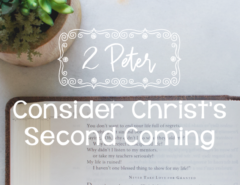 We’re focusing on the gospel all month here on the blog. Since the nature of the gospel can be hard to understand, and even harder to believe, I’ll let Romans 5:8 give us a quick recap. We are sinners who cannot stop sinning. The penalty we deserve for our sin is death. Jesus died for us, even though He knew all about points 1 and 2. His death made a way for us to be reconciled to God. 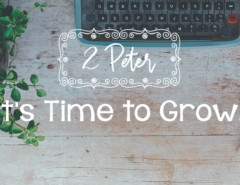 If we go to church very long at all, we can become very familiar with the gospel message. When we are in our church clothes around our church friends, we’ve learned how we should respond to the gospel. But if you’re like me, sometimes I respond to the gospel in ways I wouldn’t necessarily want my church friends to know about. Yesterday, I told you about the Eeyore in me. 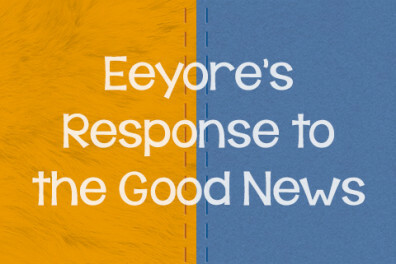 Today, let’s look at another response to the gospel taken from the Hundred Acre Wood. When we react to the news that Jesus died for our sins like Tigger would, the results aren’t so great. He bounces from point A to point B. Sometimes he exhausts and exasperates his friends with his constant bouncing. Tigger’s confidence is in himself. There’s nothing he thinks he cannot do. Tigger’s actions sometimes lead to chaos. He’s well meaning (and likeable! ), but Tigger usually does more harm than good. What does Tigger have to do with the way we respond to the gospel? All of this is pretty wonderful when it describes a fictional character in a book, but when we react to the news that Jesus died for our sins like Tigger would, the results aren’t so great. Often, we respond to the gospel by trying to earn God’s love. We think . . . If I can just impress Him, He won’t care so much about my sin. If I can just be the very best daughter, sister, friend, in the whole planet, it will somehow make up for the fact that I am a sinner. If I can be a super Christian, Jesus’ death for my sins will somehow make more sense. Ultimately, girls with a Tigger heart love gold stars. We love high fives. We love attagirls. And if we are not careful, we can live our whole lives bouncing from one attempt to earn God’s approval to another. Check out Romans 6:23: “For the wages of sin is death, but the free gift of God is eternal life in Christ Jesus our Lord” (emphasis added). The gospel is a free gift. Tiggers know that, but we think we still need to figure out a way to earn it. Tiggers, lean in. Listen close. Check out Romans 5:6–8. For while we were still weak, at the right time Christ died for the ungodly (v. 6). He didn’t die for you because you’re a good girl. Good girls don’t need a Savior. For one will scarcely die for a righteous person—though perhaps for a good person one would dare even to die—but God shows his love for us in that while we were still sinners, Christ died for us (vv. 7–8). The gospel is this . . . Yes! You are a stinkin’ sinner. The price you deserve to pay is death. But God died to pay the price. He died for us because He loves us, not because of the number of gold stars we’ve earned on some imaginary chart. If you miss the gospel, you will spend your time bouncing from one thing to the next trying to earn God’s love and acceptance. Just like Tigger, you will end up creating a chaotic heart in the process. Living the Christian life like Tigger is like trying to work for a car that someone has given you. It’s a free gift, but some of us are working ourselves to the bone to try to pay for it. Striving to be perfect and being overly hard on ourselves when we fail. Being involved in every good thing we have the opportunity to participate in. Mistakenly believing that God will love us less if we miss our quiet time. Running at a pace that leaves us totally exhausted all the time. In the end, we know we are Tiggers when we feel totally exhausted by our faith instead of grateful and set free by the gift Jesus willingly gave. How can you know if you’re trying to earn the free gift Jesus died to give you? Let’s look back at what defines Tigger with that big question in mind. Tigger bounces from point A to point B. Are you constantly running from one thing to the next, trying to earn God’s approval? Tigger sometimes exhausts and exasperates his friends with his constant bouncing. 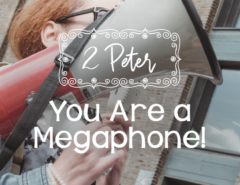 Are the people in your world exhausted by your constant doubts about God’s love? If you’re not sure, ask them! Is your confidence in God’s love for you really rooted in your ability to be a good girl? Do you have a chaotic heart? Tigger means well, but he usually does more harm than good. Is it possible you are harming yourself and your relationship with Christ by trying to earn a gift that He freely offers you? Let me be the first to admit I have a lot of Tigger tendencies. I bet I’m not the only one. Is there evidence in your life that you respond to the gospel like Tigger would? Tell me about it below. Be specific. 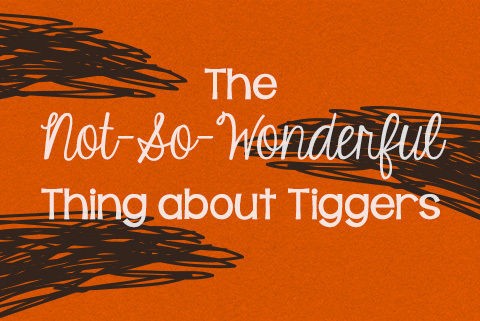 When it comes to the gospel, there’s a not-so-wonderful thing about Tiggers. Find out more on @lywbblog today.